Barbara of the GI in Nairobi forwarded the following invitation to a public forum, which? I? think? is? of? public? interest,? hence? the? desire? to? reblog? this? on? my? blog. 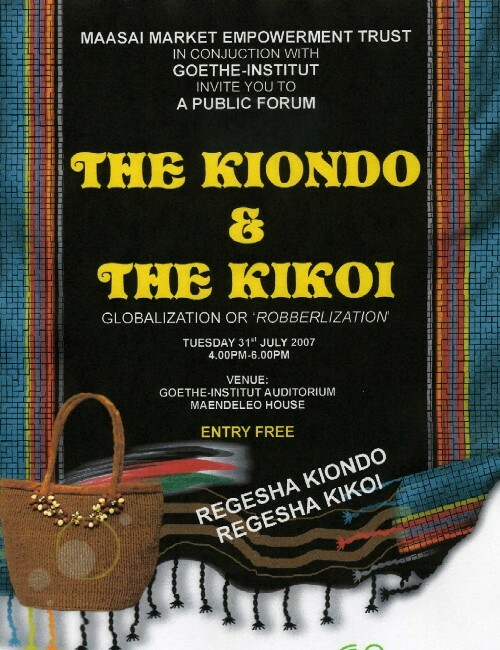 “The Maasai Market Empowerment Trust in partnership with Legal Research and Advisory Centre invites to a Public Forum “The Kiondo & The Kikoi”.This is a cooperative effort in the highlighting and development of Intellectual Property Rights in Kenya. Also, I am using a picture of a Kikoi I bought on Maasai Market as the header logo of my blog. I founded a Kikoi group on the German equivalent of Facebook, Studivz.de, and am having a particular interest in promoting this part of the Swahili culture as found on the Kenyan coast line. I never travel without one of my Kikois, and as such find myself at terrible unease to associate the brand name “Kikoi(y)” with a UK based privately held company. Sorry Jke nothing personal on your end but this is purely an opinion which maybe a little bit biased and no it is good to promote African culture but hopefully the “people” being promoted are also equally benefitting…. Well you are free to express your own opinion on this, but I wouldn’t reduce this to the usual skin colour/mzungu point of view. I think we have to make a difference between those who market the Kikoi as a brand and a fashion item for various groups (and not only some spoiled KCs @ 40 Thieves) and those who register the name as a brand outside the country. I’m not just reducing it to a the usual Mzungu critique ( you know me better than that I hope by now) but yes it is a good charitable organization but there are many local groups championed by the local mwafrika who advocating for the same thing perhaps more or less , but immediately a Mzungu puts a stamp on the same kind of organization, immediately it is a viable project. You see where I’m going with this? It is a shame that maybe, just maybe the Mwafrika does not have the power to go it alone until a back up comes along to boost it. Maybe what I’m saying is that Mwafrika also needs to educate himself into understanding his worth instead of waiting for outsider to tell him what he is worth. can you please contact me regarding a domain you own.